Understanding child development is not an easy task. It requires a lot of study and research in order to come up with a logical and systematic approach. Raising a child does not consist of following a recipe. It is not based on instructions. There are no specific procedures or steps on how to raise a perfect child. The role of the parents is apparently very crucial in the process because their children look up to them as role models. However, parents can an do make mistakes. They are not perfect. It is therefore important to fully understand the significance and relevance of different parenting styles and how these distinctive styles impact child development. Parents influence their children in so many ways. This is the reason why it is always best, first and foremost, to ask yourself this question: What kind of parent am I? It may sound simple but it is definitely a tough one. It can certainly leave you lost in thought for several minutes, or hours, or even days before you can come up with an answer. It can be disappointing if you do not know who you are as a parent. Without having a strong sense of who you are as a parent you can end up like a ship without a rudder. If you plan to hire a nanny, for example, it is important that the nanny can take on your role effectively when you are not available. It can be difficult to find a suitable nanny, going to a maid agency is probably not your best move because a nanny's job can be a very specialised one. Do you know that there are many parents who do not share the same ideas about parenting styles? That is right! Parents have different personalities and they are all unique. What they do though is for the best of their children. There is actually no such thing as bad or good parenting. But, of course, parents can influence children both in a positive and negative way. Styles come in different titles and definitions. Nowadays, the world is no longer limited to two types of parents – strict and lenient. Parenting styles, too, have evolved dramatically. Thus, it is best to hire a nanny who can copy your own parenting style, but perhaps in a way that is less daunting, exciting and more child-friendly. 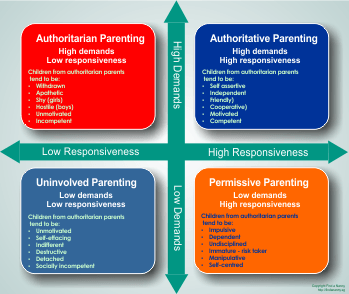 In a general sense, parenting is categorised into three different styles – Authoritarian, Permissive and Authoritative. In order to make an informed choice when hiring a nanny or a part time maid, let us delve deeply dive into each the parenting style. The most common style of parenting is authoritarian. Parents tend to be controlling because they expect their children to follow strict rules established by them. This approach aims to manage the behaviour of their children and expectations from them are high. 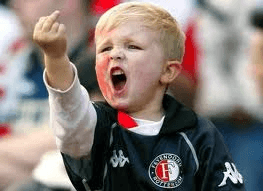 Although it is true that strict parenting produces well-behaved kids, it can also make them rebellious. Furthermore, strict parenting can create a serious problem between parent-child relationship. A nanny is primarily a child care professional who understands that it is good to set guidelines to children but they need to be reasonable and realistic. Permissive parenting, on the other hand, is the opposite of authoritarian. In this style of parenting, parents believe that children should be given the freedom of choice. The word “lenient” comes back to play in this type of parent. Of course, you do not want to hire a lenient babysitter or a domestic helper. They should be able to handle kids even in their most difficult times. Children who experience more freedom than other children are often difficult to handle. Choice and responsibility is good for children but it is still absolutely necessary that they are not allowed an excessive amount of freedom. Setting limits, after all, is an important part of parenting. A good domestic helper must know this. The authoritative style of parenting is probably the category where most of the parents fall into. In building a great relationship with their children, parents connect with them by setting up rules and guidelines and take time to listen to what their children think. Open communication is the key. These parents tend to be more nurturing and thus they can easily earn trust and respect from their children. Like authoritative parents, nannies should also encourage independence, allow children to express their opinions and at the same time administer fair and consistent discipline. Children who are raised by authoritative parents tend to have a happier disposition because they have good emotional control. In addition, they also show good social skills. 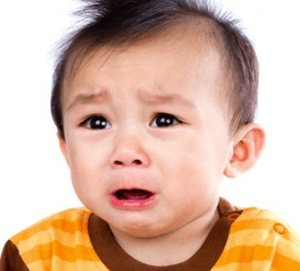 In the previous two posts (Using Time-out on the Kids in Your Care and Strategies for Managing Time-out Sessions) we talked about the technique of giving your child time-out as a way to control his difficult behaviour. It teaches children that there are consequences to bad behaviour. It is a form of disciplining which is effective without being unduly harsh, however it does have a degree of negativity to it. So now we'll discuss other, positive, ways to encourage your child to do the right thing. It's called positive reinforcement, and it it really powerful. Of course most parents are already aware of positive reinforcement in an intuitive way. You encourage good behaviour through praise, rewards and shared activities which gives them the incentive to carry on behaving well. It helps to strengthen family bonds and build self esteem, trust and respect between family members, which is what we are aiming for. Like any other technique, there are some traps to avoid. It is easy to unwittingly give positive reinforcement to a child and strengthen bad behaviour. An example of this is if a child throws a tantrum in a store, an easy way out would be to buy some candy or a toy in an effort to get him to behave. The result of course, is that the child soon learns that he will be rewarded for bad behaviour. Another thing to be wary of is that there is a fine line between reward and bribery. Bribery is a quick-fix method of getting the desired behaviour. So a promise of a trip to the cinema and a bucket of popcorn if homework is completed within a certain time is getting pretty close to a bribe. A warm smile, a hug and a compliment shows how delighted you are with what your child has done and helps to ingrain the correct behaviour and ensure it continues. On the other hand, when the bribing stops, so does the behaviour. Some people (my MIL) seem to think that too much praise is a bad thing and you will spoil the child (I hate that word, what does "spoil" mean?). If I tell my daughter too many times how pretty she looks, or how nice her finger-painting is, or how nicely she played with her friends, will she become conceited? No, I don't believe she will, but she will get a warm glow that will stay with her for a while. You have to be careful to give praise appropriately. Kids can see right through praise that is condescending, not genuine, or is misplaced. So you have to give it honestly and appropriately. 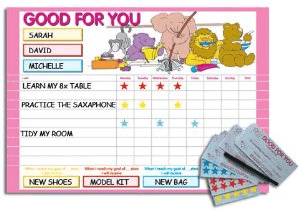 One method of giving rewards for the very young, is to use star charts or reward charts. These are good because the child can observe, and get delight in watching the progress towards the goal or reward on a colourful chart. Watching a star get removed for bad behaviour may fill them with remorse, but seeing two more added as rewards for doing good, will fill them with pleasure and help to keep them motivated. Giving time-out as described in the previous blog post is an effective way to control anti-social behaviour, but if you are just starting to implement the technique, you may run up against some difficulties. This blog post is to help you overcome them, and keep the program going. One thing that is very important is the warning. You may think that the child should already know that what she is doing is wrong. But actually, since she is caught-up in the heat of the moment, she is only thinking of the situation, and not realising she is behaving badly. That is why the parent, nanny or care-giver must step in quickly and firmly, describe what is unacceptable about the behaviour, and remind her that time-out will be given unless it stops immediately. The warning is a sudden stop-and-think punctuation mark which sometimes jolts the kid out of the behaviour making having a time-out unnecessary. If you were to immediately grab the child and march her off to the time-out place, she won't have had a chance to think about what she is doing, and you have not given her a chance to stop it. She will be resentful that you acted so hastily and so harshly, and this may ratchet-up her bad behaviour. People can be cruel, you only have to watch news programs on television to realise that evolution has endowed us with a potential for viciousness which still simmers beneath the veneer of civilised behaviour. All parents and childcare professionals need to be aware of the damage bullying can do to our precious children. No child should be a victim of bullying as it can lead to lasting psychological problems including depression, anxiety, low self esteem, and thoughts of suicide. Let's define bullying: A bully exhibits repeated aggressive behaviour which causes another person hurt or distress. Bullying can be physical, verbal or more subtle actions such as cyber-bullying using the Internet or mobile phones or other digital technologies to harass. The person being bullied usually cannot defend his or herself, and in most cases does nothing to cause the bullying. Bullying can happen anywhere, but often it will be in the school building or yard, the school bus, the child's neighbourhood or on the Internet. 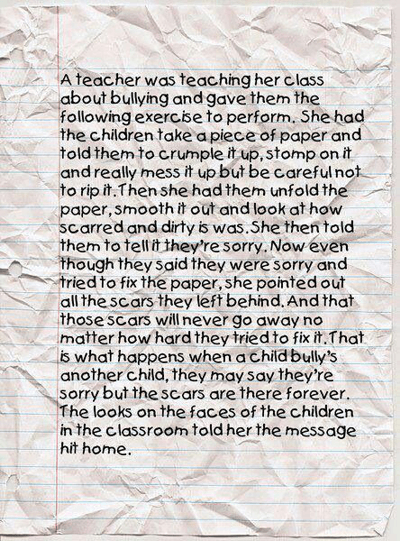 I have heard some people saying that bullying is inevitable and is just an experience children have to go through. But it should not be tolerated, it is not a passing phase that children will grow out of. It can and does cause lasting and serious harm. Frequent claims of illness. such as headaches. More often than not children do not ask for help. bullying can make them feel helpless and may be telling themselves that they can manage the situation on their own so that they will be able to feel in control again. Also children may fear reprisals form the bully if he believes that his behaviour has been reported to an adult. Being bullied is very humiliating to the victim, they often do not want to repeat the things being said about them and they may be worried that it will appear trivial to an adult. What should you do if you suspect you child is being bullied? Immediately contact your child's teacher and explain your fears. She may have noticed some bullying behaviour but is unaware of the extent of it. The teacher may recommend that your child sees the school counsellor, or you can make that request yourself. If you feel that you are not getting satisfactory answers take it further by contacting the school principal or even the Department of Education. If you feel that you are not getting the full story from your child, talk to his friends and the parents of his friends. Do listen to your parent's intuition as the damage caused by even relatively brief episodes of bullying can last a lifetime. Want to be His Nanny? Different people may well have different opinions of a particular child. Typically an assessment by the child carer or nanny will not be the same as the child's parents who usually think that their angel can do no wrong. They throw a tantrum whenever they cannot have something they want. They may fall on the floor, scream, and even hold their breath to the point of turning blue. Although the breath-holding can be worrying, the child cannot actually harm himself by doing this. They constantly dissolve into tears and unruly behaviour. They may hit and bite you when you punish them. They hit, push, or bite other children when they cannot get their way. They ignore your commands or instructions. They will not share things with other children, and bully them by taking away their toys. They constantly show-off, and try to be the centre of attention, which may well point to a lack of attention at home. They always want what whatever anyone else has, often they take it by force, and once they are in possession of it, they want something new. They have frequent crying spells for no apparent reason. They refuse to settle down in bed and take naps. They cry continuously until you come and give them some attention. They defy you frequently and often stubbornly say "no" when you give them instructions. Firmly and resolutely discipline children when they show disrespect. You must demonstrate that disrespectful behaviour towards you, other adults and children will not be tolerated. the method of discipline may involve time-out, a firm and louder-than-normal voice command, or removal of a favourite toy. In my view, it should not involve any physical punishment, like smacking. That should not be necessary and has the potential to get you in all sorts of trouble if you are the nanny. Develop a routine and stick to it. Children feel more comfortable and secure with routine in their lives and need adults such as their child care provider and parents to establish it. Teach them gratitude and piety. Difficult behaviour is a symptom of selfishness. when kids learn the importance, and feel the rewards of helping others, they are more likely to be thankful for similar behaviour directed at themselves. Do not over-indulge their every whim. Let them know that not everything in life comes easily upon demand. When they do cooperate, give copious praise and perhaps a sticker to display prominently somewhere. Don't ever offer candy as a reward. 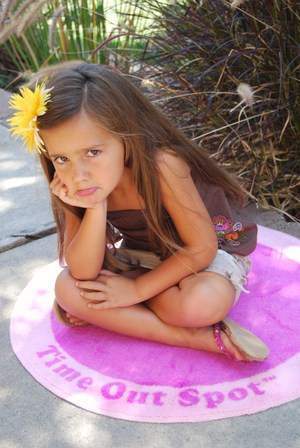 Difficult behaviour in children is often a way to attract the attention the child craves. Every child needs a certain amount of special attention, where he feels that he is important to the child care professional or parent. Do give that one-on-one attention for some time everyday. It helps the bonding process and makes the child feel special. Compliment the child when he or she does the right thing. Be genuine in your praise. You may need to discuss these strategies with the other parties involved in caring for the child. Nannies and parents must work together if you are to improve the child's behaviour. If nannies and parents work together consistently you will notice an improvement in behaviour, sometimes dramatically so. Be patient. Although it is a worrying time for a parent, give your child a little space. Don't put too much pressure on him or her to tell you everything immediately. Most likely they will come to you of their own accord once they have had a bit of time to think about it. Check with a brother or sister. Your other children often know more about what is going on around them than you may think and if the situation is serious, they will most likely be concerned enough to tell you what they understand about the situation. Do not show anger. Although the situation might be very worrying, allowing your frustration to show is the surest way to break down communication and will just cause your child to retreat into the safety of their inner world. Look for clues. A child who never wants to go to school, or who cries when the babysitter arrives, might be just expressing anxiety from being separated from her parents, or she might be frightened of bullying at school or poor treatment form the babysitter. Do check for signs of physical abuse. Sometimes, out of a misplaced sense of shame or embarrassment, children will try to hide bruises caused by bullying. Encourage them to talk to you about their feelings on everything. Don't chide or ridicule your children, even if you feel they are over-reacting to a situation. Get them to verbalise their feelings and then ask questions that allow them to explore possible outcomes of various actions. Meet with your child's teacher. They will have at least some idea of any difficulties your child may be having with friends, if she is being picked on, or if she is having difficulties with her lessons. Ask them if she would like to talk to somebody else. Most schools have a counsellor, or a teacher who every child feels comfortable with. Your child may feel better talking with them, especially if the problem is concerning something happening at school. 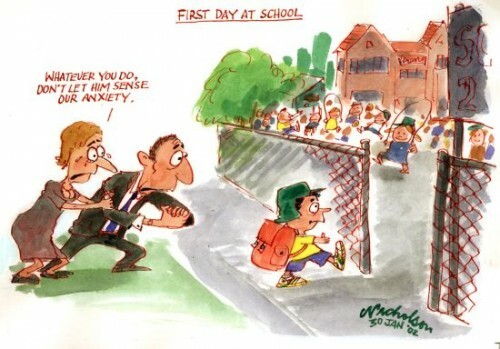 If your child's anxiety and troubling behaviour lasts for more than a day-or-so, it is important to find out the cause. Let your child understand that you are concerned about her and want to resolve the situation quickly. This will help to build trust and ensure that in future similar situations your child will come to you for help.